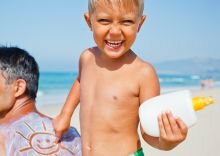 The Environmental Working Group (EWG) released its 12th annual Guide to Sunscreens, rating the safety and efficacy of more than 1,000 sunscreens, moisturizers and lip balms that advertise sun protection, and found that 67 percent of the products don’t work well or contain ingredients that could harm health. Most sunscreens on the market contain ingredients like oxybenzone, which Hawaii lawmakers recently moved to ban due to its role in coral bleaching and coral death. Oxybenzone is found in the majority of products on the market, including nearly all sunscreens advertising an SPF value greater than 50. Despite the 2014 Sunscreen Innovation Act, the Food and Drug Administration hasn't approved any new sunscreen ingredients in a decade. Sunscreen products are capped at SPF 50 in Europe and Japan, and 50+ in Canada and Australia. Capping SPF claims is one important way the FDA could improve consumer protection in the U.S., because sunscreen companies continue to flood the market with higher SPF products that offer inadequate UVA protection and leave consumers vulnerable to sun damage.